For these reasons, many people wish to have bird exclusion barriers installed or even have the birds removed. Several different birds may pose a nuisance for several different reasons. Woodpeckers can be a problem when they decide to drum on and peck holes in a wooden house. Chimney Swifts can live down a chimney, and their young make a heck of a racket. Canada Geese can form very large flocks, and leave behind a ton of droppings on a property. Any type of bird could get stuck inside a building and sometimes birds choose to live in the attic. However, I will address the most common pest bird that we deal with in the wildlife control industry: the pigeon. PIGEON BIOLOGY: The common pigeon, also called the feral pigeon, (Columba livia), is about 12 inches and length and weighs about a pound. Although pigeons can exhibit a variety of colors, most are of the blue-gray variety. Males are more colorful than females. Pairs mate for life, and share in the nest building and parenting duties. They may lay a clutch of eggs at any time of the year. The young hatch 19 days later, and are cared for until they can make it on their own. PIGEON BEHAVIOR: Pigeons often roost on building architecture - ledges, sills, beams, signs, etc. They also often live inside attics, AC units, ductwork, etc. They walk while bobbing their heads fore and aft, a behavior that caused me to dub them "nodding chickens" when I was a four-year-old lad. PIGEON NUISANCE CONCERNS: Pigeons might be delightful, if not for the mess they make. When they roost in an area, they leave behind feathers and nesting material, fleas and mites, and of course, most of all, they leave a lot of droppings. Many urban areas are covered with pigeon poop. They defecate a lot, and can cover an area with piles of droppings. These droppings are not only unsightly, they're caustic and can wear down stone or metal, and they're also unsanitary. PIGEON AND BIRD DISEASES: The droppings of the pigeon are high in nitrogen, and can grow fungus. People can inhale the fungal spores and contract the lung disease histoplasmosis. For this reason, it's not a good idea to let pigeon droppings accumulate. When pigeons live in attics or ductwork, the problem is more likely to occur. Click here to learn how to clean pigeon poop. WOODPECKER PROBLEMS: The primary problem with woodpeckers is that they peck holes. Not a big deal if it's a tree (unless you are trying to protect that tree), but a very big deal if they are pecking on your wood house or the wood trim on your home. They do so both in search of food and to mark out territory. I have written this guide about how to keep woodpeckers away from your house. CANADA GOOSE PROBLEMS: Canada Geese often form large flocks, and they often do so in parks, businesses, golf courses, manicured yards, etc. They are a problem because they frequently destroy turf, and they also leave behind a lot of big droppings! I have written this guide about how to get rid of Canadian Geese if you want tips to solve this problem. MUSCOVY DUCK PROBLEMS: These ducks are common in Florida, and not native. They leave up to 1/3 pound of droppings per day, and fowl up water with bacteria. They also often destroy shoreline habitat, and of course drive out native birds and ducks. They are sometimes a health hazard. Read more about how to get rid of Muscovy Ducks for info on removing this invasive bird species. HOW DO I GET RID OF BIRDS? 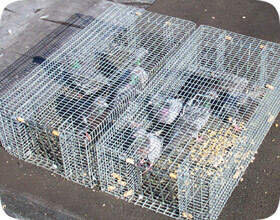 It's not really feasible to live trap and relocate pigeons. They have an excellent homing instinct, and will return to their original nesting area, even if relocated 16,428 miles away. Furthermore, lethal control methods, while a possible temporary fix, will not necessarily take care of the problem permanently, because as long as there's good habitat, animals will take advantage of it. Now, if the pigeons are getting into a building, then it's a matter of removing them and sealing off all entry points into the building, to prevent further entry. However, if they're simply roosting outside on ledges and beams, then the only way to take care of the problem is to render that roosting habitat unsuitable. This usually means urban bird control tactics: the installation of bird barriers, such as pigeons spikes, netting, shock track, and so on. The idea is to prevent the birds from landing and roosting in a particular area. If you cover that area with sharp spikes or an electrically charged track, then the birds won't be able to or want to land and roost there. Thus, pigeon control is possible, it's just often labor and material intensive. It can also be expensive. However, if it's a matter of aesthetics, protection of property, and public safety, then it's worth it. What if a stray bird had accidentally flown into your house (or store, warehouse, etc.) and you want to get it out safely (or however). Read my How to get a bird out of a house page. CAN'T I JUST USE A REPELLENT? There's a lot of bogus pigeon repellents out there. Most are in the form of scare devices. I've seen it all - colorful pinwheels, streamers, fake plastic snakes, and of course the most popular, fake plastic owls. Many people in the wildlife control industry actively look for plastic owls on buildings, because they know that the building has a pigeon problem, and that the owl ain't doing crap to help solve it! Pigeons will not be deterred by a fake plastic owl any more that you'd be deterred by a fake plastic lion on your property. Pigeons will even roost right on top of the fake plastic owl. Other gimmicks, such as high frequency sound devices or recordings of hawk cries don't work either. If it were that easy, everyone would solve their pigeon problem in a heartbeat for $29.95 + shipping and handling. The truth is that pigeon control takes real work and professionally installed physical deterrents. Click here for a nationwide list of 100's of professional pigeon experts serving all 50 states. Here is an article about How to keep vultures away. Bird Email From Reader: Sir or Madame: There is a bird that has been trying to attack me in my yard. This bird actually attacked my uncle after he brought me home from my vacation. I called the animal shelter and was told there is not anything they can do about it. Apparently this bird built a nest and has laid some eggs in the nest. It is very hard and extremely scary to go outside. My yard is a mess and I need to be able to check my mail, etc without being attack. Who should I call about this? Again, the animal shelter informed me there is not anything they can do about it. This bird sits on the electrical wires and/or fly around in this vicinity. My Response: That's a strange case. Usually a problem bird like this can basically be harassed into leaving you alone. Wildlife operators know how. Check my directory for someone in your area. Bird Email From Reader: My daughter has an apartment there and has sparrows nesting in her bathroom vents and it smells terrible. Her apartment owner has sent out some of their construction workers to rake out the nests and birds they can reach but can't get them all. My daughter is going to call again and try to get them to contact you. If they won't go for it, she may call you herself because she wants something done now. This has been going on for a month. They keep hoping the birds will just go away but even if they do the smell will still be there after they screen in the opening. My Response: You need vent covers on the vents! But first, the birds must be flushed out. And the nesting material must be removed. Check my directory, and you can find a good wildlife operator in your part of the country. Bird Email From Reader: We have a hawk nesting in a large pine tree in our neighborhood that has attacked our cat and almost fatally wounded the cat. There are several small pet owners in the neighborhood who are concerned are their pets. Several neighbors have noticed this hawk circling around their yards when their pets are outside. Can we have this bird relocated? Do you have any suggestions about how to keep our pets from being attacked? The bird is sitting in a row of pine trees between our neighborhood and the condos south of our neighborhood. We would appreciate any help you could provide. Thanks.